I usually don't like these things - but I couldn't help but go to a place that takes a sample of your writing and tell you who you write like. Yep, that guy. Never heard of him - but he writes some interesting stuff . I know, the Pearl Jam version is better. The Washington Times has picked up our Diversity Accountability story in an editorial; High seas segregation:The Navy is listing dangerously in politically correct water. They nail it. In practice, the Navy will be creating a list of privileged "diverse" officers who will enjoy special benefits and career mentoring not available to people of the wrong race, as well as a virtual guarantee of fast-track access to the highest reaches of command. 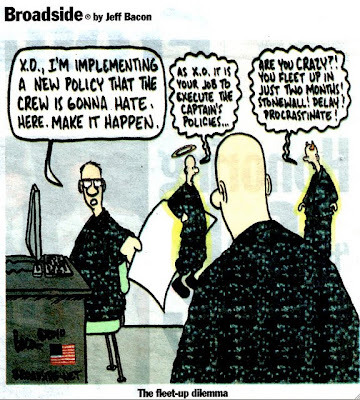 Fifty-six years after the Supreme Court struck down the concept of "separate but equal" treatment of races, the U.S. Navy is erecting a wall of segregation between what will amount to two parallel promotion systems: one for the "diverse" and another for the monotone. If this isn't illegal, it should be. This type of backward, 20th-century, overtly racial thinking has no place in 21st-century post-racial America. The Navy leadership apparently believes the way to promote racial harmony is by engaging in blatant, invidious discrimination. In practice, however, this system will, in fact, relegate "diverse" sailors to a form of second-class status. Any nonwhite male sailor who - through intelligence, initiative and drive - builds a stellar career will simply be seen as just another special case, just one of "the Listers." Those sailors may achieve rank, but they will have to work twice as hard to command respect. The suggested list of privileged officers is due Monday. The message states that the reporting requirement will not be put into the secretary of the Navy's TV4 Taskers tracking system "due to the sensitive nature of the by name list." No doubt, once the secret list leaks, as it surely will, there will be as much discomfort for the people on the list as for those not on it, especially those unfortunates who met the diversity requirement but for some reason did not make the cut. Maybe they can sue, charging discrimination. Either way, the Navy Department has run aground. Outstanding. More fresh air and light. An encore FbF from 2006. Oh, and for some perspective about how far the Battleship came to peak of the Iowa class, here is a nice pic of her next to the uprighted USS OKLAHOMA (BB-37). As a final commentary - the USS OKLAHOMA (BB-37) was commissioned in 1916. The USS WISCONSIN (BB-64) in 1944. 28 years. Click that link above and come back. The first TICONDEROGA class CG was commissioned 27 years ago. The next "ship of the line" to be commissioned will be the Flight IIA ARLEIGH BURKE Class Destroyer USS William P. Lawrence (DDG-110). There are a couple of transformationalists that I have friendly exchanges with on-&-offline. Their constant refrain is that we are in a period of radical technological advancement. That always bothers me - no, we are not. 1898-1918. 1916-1944. 1939-1962. Please. We are not even close to be in a period of quickening. If we looked as technology as a tool and not an answer, we would save a lot of blood and treasure. Be humble. Niall Ferguson has a critically important article out at RealClearWorld. History and economics. Facts are hard things. ... imperial falls are associated with fiscal crises: sharp imbalances between revenues and expenditures, and the mounting cost of servicing a mountain of public debt. And were do we stand in comparison? You have heard me warn of the budetary train wreck that is coming. The shipbuilding "Terrible 20s" - and the fact that the salad days are long gone. Why? We have a lot of friends in the world, we like to tell ourselves, but remember - nations do not have permanent friends, but permanent interests. ...half the federal debt in public hands is in the hands of foreign creditors. Of that, a fifth (22 per cent) is held by the monetary authorities of the People's Republic of China, down from 27 per cent in July last year. It may not have escaped your notice that China now has the second-largest economy in the world and is almost certain to be the US's principal strategic rival in the 21st century, particularly in the Asia-Pacific. Quietly, discreetly, the Chinese are reducing their exposure to US Treasuries. Perhaps they have noticed what the rest of the world's investors pretend not to see: that the US is on a completely unsustainable fiscal course, with no apparent political means of self-correcting. That has profound implications not only for the US but also for all countries that have come to rely on it, directly or indirectly, for their security. But what if the sudden waning of American power that I fear brings to an abrupt end the era of US hegemony in the Asia-Pacific region? Are we (Australians) ready for such a dramatic change in the global balance of power? The view from the outside is often needed. 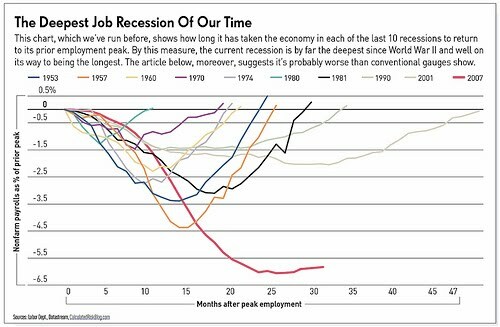 Things are fixable - but time is money, and we are running out of time to stop this run to the cliff's edge. So, how do you "Operationalize Diversity?" How will the Navy respond to the CNO's push for "accountability in Diversity?" - Are you or would you be a willing and enthusiastic participant in this? - Does this make you feel unclean? In preparation for the annual Diversity Accountability Brief that I will be giving CNO next month, my N1 has put together the attached slides. The data, pulled from TWMS earlier this week, represents what is in the system but actual assignment of personnel in your XXXXXX may vary. Please review and submit changes as necessary. A change in focus of this year's diversity brief is the desire to identify our key performers (by name) and provide insight on each of them. CNO is interested in who are the diverse officers with high potential and what is the plan for their career progression. He may ask what is being done within to ensure they are considered for key follow on billets within the Navy. This list must be held very closely but will provide ready reference to ensure we are carefully monitoring and supporting the careers of the best and the brightest the Navy has to offer. Please review the data provided and report your concurrence or identify specific anomalies. Your insight to the diverse composition of your command will assist in my discussion with CNO. Additionally, provide your by name list including career insight for your top performers (03 and above) in those key positions. This reporting requirement will not be put into TV4 taskers due to the sensitive nature of the by name list. Input is due to me by 2 August 2010. Yes - I noticed the race exclusive "best and brightest." This isn't the B&B of all the Junior Officers - but only a select group based on certain self-identified races and ethnicities. Makes you proud of the Navy - doesn't it? Thumbs on the scale - open and plain. Undue Command Influence on your FITREPS and detailing based on race and ethnicity has gone wholesale. More proof, as if you need it, that we do not treat our officers equally regardless of race, creed, color, or national origin. This goes well beyond the retail phonecalls or subtle hints - this is full-frontal; red in tooth and claw racism. And to help with the last word in para 2. This makes me sad. The response from the CNO's office on this email. Consistent with CNO's Diversity Policy, the purpose of any Diversity Accountability Review is to ensure Navy leaders are involved and active in creating an environment where all Navy personnel have opportunities for personal and professional growth. The Diversity Accountability Review calls for Navy leaders to show how they are mentoring and enabling the men and women in their commands to meet their full potential based on performance, and making sure that opportunities to reach more senior levels of leadership are available to all in an equal manner. Why sad? Because this pursuit of the ill-thought out has made my Navy sound like a bad politician. It can't defend what it does in a clear and defined manner - because it knows that it is wrong. All you need to do is see the use of "all." That is a false statement on its face. The followers of the Diversity Cult do not concern themselves with "all" - only a few select groups that buys them political support and feed their need - whatever that need is. In this specific case - they are not doing a data call on all. Only a select group based on race, creed, color, or national origin. Orwelian. "All" doesn't mean all as the plan is being executed. In practice - in Operationalizing Diversity - "all" means "selected racial and ethnic groups." Full stop. When you throw in a loaded word like "accountability" - you are sending the signal that you will punish those who do not meet your metrics as you define them. In this case, the demand is that you discriminate, and prove by numbers that you do. When you do that - you are acting in a racist manner. If you can explain it better - let me know. Let me finish with this; I have done it before - time to do it again. Another word. In summary and to repeat again for emphasis - at the highest levels of our uniformed leadership, there is a desire to hold subordinate leaders accountable if they do not rank, career manage, and detail officers by a process defined by discrimination on the basis of race and ethnicity. What started out as good intentions turned to tragedy, then farce, and finally racism. Welcome to the post-post-racial Navy. Senator Webb - please call your office. The comments from a bud in deep cover is so good, I'm stealing them wholesale. Click here for the vid. Some neat things in here about small boats or, as millionaire Maria Cantwell calls them - "little boats." Sort of like John Kerry's little boat "Isabel"... Or Cantwell listening to ADM Papp's response then saying: "I'm not sure I understand what you just said so I'm going to stick with my line of questions." But my favorite part happens at about 114:00 when Sen. Rockefeller is talking about the Coast Guard using their Uzis and AK-47s. Maybe they use Uzis but AK-47s? Why "trust in your elected representative" is no excuse for your inaction. From his farewell speech - which you can get here - a small quote to ponder. Winston Churchill said we make a living by what we get, but we make a life by what we give. To the young leaders of today and tomorrow, it's a great life. We are well in to the second month of discussions here, in the blogosphere, and traditional Navy media interests about The Balisle Report. One reason I think it resonates so much is that it serves as a solid validation of the warnings that have been sent out from both inside and outside the Navy's lifelines about the exceptionally wrong-headed path of the transformatinalists and the MBA-centric ideas that caught the fancy of Navy leadership. It wasn't that there weren't good ideas that came from the transformationalists - there were. It isn't that there weren't appropriate places for MBA-centric ideas - there were. The problem was that transformationalism became a selfish, bigoted, and intollerant religion of the revolutionary that treated those whose ideas were rooted in the concepts of evolutionary progress and the lessons of history as a Medieval Christian knight would a pagan. The stories of how warnings were ignored are legion. This isn't about the wee-crickets in the Navy blogosphere though. No. I want to take you back to the month before this blog started. Back to JUN 2004. Some of you may recall that the USS Milius (DDG-69) had an Optimal Manning Experiment conducted on her in the middle of the last decade. I have a copy of the report by John J. McMullen Associates, dated 21 JUN 2004. Interesting reading, and in a way sad. Initial conclusions / assumptions are that OM is working aboard Milius. Indications of their success is illustrated in Attachment A, Optimal Manning Metrics”. However, the question begs, “At what cost to the sailors at the deck plates”? In the information and reports that I gathered there are several significant inconsistencies that are in need of clarification. Were there 52, or 63 billets moved ashore? The 3M Coordinator says that moving PMS ashore to SIMA is a failure. 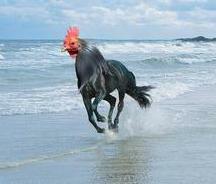 SURFPAC & the ships Final Report says PMS ashore is a success. The ship says Gapped Billets are at 14, with an average of 3.07 Gapped Months per billet, and the problem is worsening. SURFPAC says the ship only has 4 Gapped Billets and it is of no problem. SURFPAC and the Milius Final Report say that the OME was / is a success. Many of the crew interviewed have a different answer. If it is working well, why are so many of the crew getting only 4 hours sleep per night? The ship was under the impression that technological innovations would accompany OM. However, essentially no technologies, other than a stamp machine / postal meter, were implemented that have actually augmented reducing the manning. The primary impression I am left with is that OM is certainly doable, but not without proper shore support. As indicated in the report, the shore support functions in need of improvement are SIMA, BUPERS/SURFPAC, & PAPA DETS. I only had about a week on board the Milius to research and get answers to a multitude of questions and subjects. Therefore, much of what I am concluding is based upon interviews, and reports written by the Wardroom of the Milius. In order to determine the validity of these conclusions it would be appropriate to interview personnel at SIMA, BUPERS/SURFPAC, & PAPA DETS. Did we even try to understand our own studies - or did we spin them? Just search for MILIUS here to answer the question. In more time than it took to go from Pearl Harbor to Tokyo Bay - how did the Navy respond to these warnings and others? Well - I think the Balisle Report tells you all you need to know. Those largely responsible for this debacle? "Accountability for thee; not for me." Put that into a Latin translator and put it on a patch. Like I said; sad. Herman Cain would have been elected Senator from Georgia ... and he would be in the White House. A man who accomplished so much in his life, understands the economy, and does not need a teleprompter. Better than anything, he is a Southerner. Sigh, what could have been. Wouldn't it be nice if we could have a Supe leave without a cloud over his head? VADM Miller and I will conduct a change of command ceremony on Aug 3 at 1p.m. in Alumni Hall. While the ceremony is not open to the general public, I want to extend an invitation to faculty and staff who are available and desire to attend. It has been an honor to serve as the superintendent of the Naval Academy these past three years. Throughout my tour I have been impressed with the dedication of USNA’s faculty and staff who are committed to the singular purpose of educating and developing the future leaders of Sailors and Marines. Additionally, the support of the community, alumni, parents and friends of USNA has been and will continue to be instrumental in the Naval Academy being able to achieve its mission with a margin of excellence beneficial to all midshipmen. It also has been a privilege to be affiliated with the young men and women of the Brigade of Midshipmen. They come from across the United States of America, representing the greatest attributes and future of our nation. During my tenure, every class that was present entered and graduated from the Naval Academy while the nation’s military was engaged in combat. These Americans seek the responsibility of service to their country. Many have proven their mettle with deployments in harm’s way shortly after graduation. It with the greatest confidence that I say our Navy and Marine Corps will be in good hands with this newest generation of leaders. I welcome Admiral Miller and his wife Barbara to the Naval Academy family. His leadership and career experiences will no doubt serve the academy well in accomplishing its important mission. I hope that you soon get an opportunity to make them feel at home, and I wish them the best. Yep ... I'd keep it private too. ... you had Rempt and Fowler both leaving under clouds - clouds really of their own making. If you could sit down with the incoming Supe over a Coke-a-cola, ... and he was nice enough to ask you, .. "What should I not focus on, or what should I not do over the next year so I could concentrate getting the Academy and my leadership on a firm setting? " Phil's response was spot on. If I were having this Coke-a-cola with him as a reporter, what I would ask him is, "How can you ensure your immediate constituency in Annapolis; the many alumni and many friends of the Academy out there, that you and the Academy's priorities are in the right place." He might say, "I am going to continue what my predecessor might be doing." or he may say, "Here is the new way I want to go." But I think that what keeps coming up over and over in the story that we at Navy Times have done and other reporters have done is that the Naval Academy right now is a football oriented/Diversity orientated school that seems to take its other responsibilities at lower levels of importance. I know that the Administration outgoing and incoming might dispute that, but that is what comes through in the reporting that you hear from sources up there, the IG Report the Navy did that detailed all these things - and so on one had there is a lot of pressure from alumni to beat Army and have a good football team and there is a lot of pressure from Big Navy to bring as many non-white Midshipmen aboard as they possibly can in order to get this hypothetically diverse officer corps that the Navy wants to build some years down the line. But on the other hand, they seem to be losing sight of what a lot of people would agree are their core goals at Annapolis to get those goals. So I would be very curious if that is going to be and that is the way it is going to stay, or there are new directions he wants to take the institution. The new Supe should probably ponder that. UPDATE: Allah is right - he should debate this guy. If there is any justice in this world - Admiral Roughead will have to explain in detail the Navy's efforts on Diversity and the steps he has made to hold officers "accountable" for their numbers. Senator Webb (D-VA) comes out of the box so intensely Salamanderesque that I can do little more then require everyone to read his latest from the WSJ. Judging from my email, many of you had. This is so good you want to get nakid and roll around in it, paper cuts be d@mned - read it all! Yes; he comes off the top-rope. Discrimination laws should be applied equally among all citizens, including those who happen to be white. The need for inclusiveness in our society is undeniable and irreversible, both in our markets and in our communities. Our government should be in the business of enabling opportunity for all, not in picking winners. It can do so by ensuring that artificial distinctions such as race do not determine outcomes. I would add that everything the government does should be color blind - and the military unquestionably should be. As we know though, the Diversity Industry and the Navy's branch, the Diversity Bullies, don't and won't let it because it feeds their racialist ideas and fills their pocketbooks. If you want to see the latest outrage - you will need to make sure and catch Diversity Thursday next week - via one of my spies, it outlines how "accountability" is being operationalized. I would hope that next-Thursday's post will make it to one of Senator Webb's staffer's hands. If it will upset him half as much as it will upset you when you read it - then there might be a chance to fix this cancer that is eating our integrity from the inside out. Senator Webb, I have disagreed with you on some areas - but that is fine and natural - but here you have 100% of my support and my greatest thanks for speaking out and saying what is true. You're good company. If the story sounds interesting, click the link above for an extended summary, or you can get the details inOperation Kronstadt: The True Story of Honor, Espionage, and the Rescue of Britain's Greatest SpyThe Man with a Hundred Faces by Harry Ferguson. Wouldn't it make a great movie ... if Hollywood still made movies of this type? Just what a weak economy needs as it tries to get its footing. ... as of midnight Dec. 31, the death tax returns — at a rate of 55% on estates of $1 million or more. The effect this will have on hospital life-support systems is already a matter of conjecture. Resurrection of the death tax, however, isn't the only tax problem that will be ushered in Jan. 1. 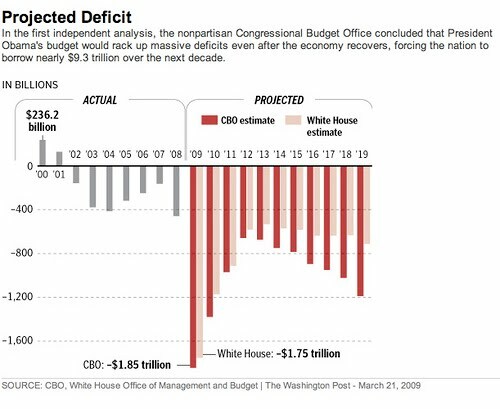 Many other cuts from the Bush administration are set to disappear and a new set of taxes will materialize. And it's not just the rich who will pay. But the damage doesn't stop there. ... and there is more, a lot more. Everyone knows we in the DON love us some Affinity Groups. We love 'em from the openly racist, by its name, La Raza - to the more mundane but just as cancerous NNOA. Affinity Group is just a PC name for organizations that base their existence on sectarianism and racial/ethnic identity politics. They are not about unity - they are about division. They encourage a mindset that plays in to the most base and destructive instincts humans have - tribalism. Their views are firmly based on the debunked racial theories of the 60s and 70s that have little relavenace to the 21st Century. Sure, they are popular in the Ethnic Studies Department and other centers of leftist thought in higher education - and of course in the Diversity Industry where they earn their keep - but in the real world - no use. That doesn't mean, of course, they are harmless. One of the oldest organizations out there, the National Organization for the Advancement of Colored People (NAACP) has moved largely from a Civil Rights group with an honorable and important part of American History to just an Affinity Group. As a result, the resulting logic falls to where all Affinity Groups do when they feel comfortable. Grevience, hate, and open racism. This is what the Navy supports when it feeds millions of dollars towards the Diversity Industry. Via our bud Breitbart .... BEHOLD ... but not what is in front of you. Yep - we are going to touch on the race story of the week. You think this is old news - and the trolls are drooling in the hope that I haven't see the whole clip where Sherrod decided that her racist attitude was wrong and she should help all ... no, I've see it. The thing is - she isn't off the hook in my book. Sure, she isn't quite as bad as the first report has her - but she isn't as good as her apologists make her. What I am interested in is not her ... I am interested in the totality of what she had to say. I am interested in the reception of her audience. I am also interested in the patronizing looking the other way at the substance, in context, of what she had to say. What I want you to do is look at the audience. Listen, with what little you can - to the audience and her. Below is the full video from the NAACP. I want to to listen to the whole thing. Process the words. Know this is the 21st Century. She seems like a nice lady trying to do good things, and she has a heart - but she cannot get past race. Especially towards the end - she is all "us" and "them." Being nice and good does not prevent you from being retrograde and wrong. I know some very nice and well meaning people about here age who are also retrograde and wrong in their views on race and should not be in positions of power. Archaic ... but in power she is. That attitude, my friends, is coming to a selection board near you. As a matter of fact, it is old news that we already have Flag Officers pushing select lists to board members based on race. Hey - it's here already. Can you help me connect the dots? Can you see something we have been warning and talking about on this blog since ... well ... we started? "I would tell you a number of our problems in shipbuilding programs, recent problems, had their roots in what I would say is a severe undervaluing of what the supervisor did, probably at the senior Navy level," Vice Adm. Kevin McCoy said at an American Society of Naval Engineers conference on July 14. McCoy said that understaffing led to a brain drain in SUPSHIP, which became critical when older employees began retiring without handing down the skills their replacements needed. "We looked at the Gulf Coast shipyards, and I want to say there was a three-year period from like 2005 to 2008 where 75 percent of the people at SUPSHIP Gulf Coast had less than five years of experience in the supervisor business," he said. McCoy pointed out that an array of vital ships are built on the Gulf Coast, including one of the Littoral Combat Ship models and amphibious platforms, making it all the more critical to make sure the region's Navy shipbuilders have proper supervision. The vice admiral assured the audience that SUPSHIP now has the funding it needs and is ramping up its staff. Existing SUPSHIP employees were also forced to repeat the qualification process, and many of them had to undergo additional training to get up to speed. "I'll settle for the next year or two at just being brilliant at the basics before we even do some of the other things," McCoy said, "and I have to know every single day that fundamental welding is correct, cabling is correct, coatings are correct, every single day I have to know it." You're welcome. You can make your consulation fees payable to a bar tab at Singletons under the name "Salamander Yacht Club." Officials Concerned Navy Is Reducing Manning On Ships Too Hastily While the Navy is driving toward reduced manning on ships to lower total ownership costs, some officials are concerned that the sea service may be taking sailors off of those ships without full foresight into the second- and third-order effects. At an American Society of Naval Engineers conference last week, Rear Adm. Thomas Eccles, deputy commander for naval systems engineering said that he saw a graphic illustration of poorly thought-out reduced manning on a new LPD-17. The ship had an automated engine room that theoretically obviated the need for keeping a watchstander in the engine room, but after a problem arose in the network, the ship had to switch to a backup computer system and sailors needed to shut down an engine. However, the automatic shut-down signal didn't detach the engine from the reduction gear, which was still being twirled by an active engine. "So when the shut-down engine with no lube oil continued to turn at a high rate because the engine on the opposite reduction gear was still clutched into that engine, we had a bad day," Eccles recounted. "And not only did I have a bad day, several of us in the room did. But the sailors on that ship had an acutely bad day. So who should have been in the engine room?" Eccles said the issue should have been obvious at a system design level, but wasn't properly thought through. "I'm convinced that what they didn't do is a sufficient job of considering what are the downside effects of taking that large processor out of the engine room in the form of the [machinist's mate second class] who could have made that shutdown and de-clutch," Eccles said. "Because that guy makes a lot of decisions, and the men and women who do that today don't have to be in our engine room, but their decision sets have to be in the right place, and until we get that right we ought to be a little bit slower about taking them out of our engine rooms. My personal opinion." Sid, Byron .... aren't the bold parts almost directly lifted or at worse paraphrased from our comments in .... 2006/7? Oh, and you can just extend that Singletons tab ... Byron is thirsty, Sid is laughing like a hyenna, and that vein in my forehead is throbb'n. With a crew in the 40s, each sailor on the LCS needs to be highly trained to take on work that would require multiple people on a destroyer. With more and more ships that require a small number of highly experienced sailors, Eccles said he is concerned about where those sailors will come from. "That's not somebody who just came out of boot camp, unless he just came out of boot camp and a bunch of other schools and somehow gained the maturity that I think is only gained at sea," he added. Other officers shared his concerns. Rear Adm. David Johnson, deputy commander for undersea technology, recalled that when the Virginia-class submarines were designed, several lower-level positions were eliminated in favor of putting two petty officers at the ship patrol station. "Great, we reduced the watch bill by six guys," Johnson said. "But the problem is, now we don't have a pipeline to feed to actually go and create the people that would sit in those seats because we took out the junior guys who actually learn to drive the ships." Johnson also argued that pushing more maintenance off until the ship is at port has created heavy in-port workloads, and the situation may be driving good sailors out of the Navy. Rear Adm. Jerry Burroughs said the problem goes beyond the day-to-day operations of a ship, especially on ships where low manning was not a part of the original design. "The problem I think we're at today is, you get to a point where you take manning down any lower, it gets very difficult to fight the ship from a damage control perspective and maintain the ship," Burroughs said. "So I'm very interested in watching LCS and seeing how that model works from a manning perspective, because it's very low, and they accounted for that in design and I'm very hopeful that they'll be successful in showing ways to do that in the future." I told 'ya. Things will reach a point where they can't push things to someone elses PCS cycle and all this will come out. Welcome to the party folks. You're buying. If 'ya ain't happy, tell it to Clark, Mullen, and Roughead - this is their baby. ... and finally - from the "Are we a learning institution" part of the Navy via Navy Times July 26, 2010 pg. 16 By Mark D. Faram. Navy leaders could cut as many as 25,000 sailors and officers from the ranks in the next few years as part of a wide-ranging drawdown they are considering to offset skyrocketing manpower and equipment costs as budgets shrink. Ummmm, no. We need to back up a few steps. If we are going to do this - you need to do what I proposed last week. You. Must. Start. By. Cutting. Flag. Officer. Staffs. Then we go through non-warfighting billets, etc - I won't go though the process again of explaining it - email me if you are new and are sans-clue. It is a false economy to think you are going to save any money in the medium to long run by having fewer Sailors on ship's manning documents. Full stop. In my latest bit over at BigPeace, Politics, Fraud, and PTSD, I review Dr. Sally Satel's important article in TheWallStreetJournal, The Battle Over Battle Fatigue. Make sure and read her entire bit. As I said over at BigPeace, if everything is PTSD – then nothing is – and that means that those who actually have real PTSD will find services diluted, funds diverted, and their case lost in a sea of fraud. On the political side, the Leftist logic train runs like this: if anyone in the military can have PTSD – then all have it. If everyone in the military has PTSD, they are not well. If they are not well, then they are to be pitied. If they are to be pitied, then they are not my peer. If they are not my peer, then their opinion is of no value. If their opinion is of no value, it can be ignored. If they can be ignored, no one will take them seriously. If no one takes them seriously, they have no power. If they have no power – they cannot get in my way. Well, since you asked CS... I arrived here in Paris today. CNO just arrived here for meetings the next couple of days at French Navy and Joint HQs. He'll be talking with French and Paris-based US media on Wednesday. He was in Toulon this weekend and was briefed at the French Navy's Med HQ, and visited a French Navy LHD, an AAW Destroyer and their carrier today, and he told me he was impressed with all he saw. The CO of the French LHD, coincidentally, had previously served with CNO. For latest on CNO's trips, you can also check out his Facebook page at www.facebook.com/chiefofnavaloperations. Charlie is good people; the CNO is blessed to have him ... but can big Navy help a brother out? 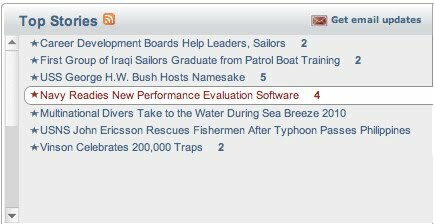 As of 20:30 last night over at navy.mil, what do we have as the top stories? If you do just a web search you get one hit from DVIDS for Toulon and Facebook and Twitter for France. That is it. 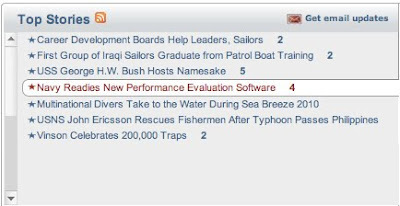 Sad thing is the DVIDS hit is a mistake - it is just VADM Harry Harris's visit to Toulon in APR that happens to be on the same page as ones of the CNO. You can see it in cache. I can understand the fact that we can put out all we want - but if the media does not pick it up, then it dies. I also understand Facebook and Twitter working - the CNO's Staff controls that. The larger issue is another example of our messaging. DVIDS and Navy.mil ... and other Navy sites just are not picking it up. I can think of few other relationships more important, outside Japan and the UK, than the one we have with the French. The fact that this visit gets so little coverage internally and externally should give us pause. Now, if I do CNO Affinity Groups I get, well - you click. PAO is a tough job - I'm glad we have pros like Charlie trying to do the best they can. Best USNA football recruiting effort yet! Why spend millions of dollars to attract young men to go to Annapolis to play football? All you need to do is show them the ... ahem ... extra benefits of the Blue and Gold. Never say I don't try to help recruit for Navy football. Oh, BTW - that's me in the gray t-shirt. No one ever dances with me, but at least my beer is cold. Hey, I know that girl. Isn't she the new JO who does all the sexual harassment training? Or is that RDML Aucoin's new Aide? I don't know what the CNO's PAO is doing ... but this story is hard to get hold of outside the biking world - even then you have to go to the French press for much detail. 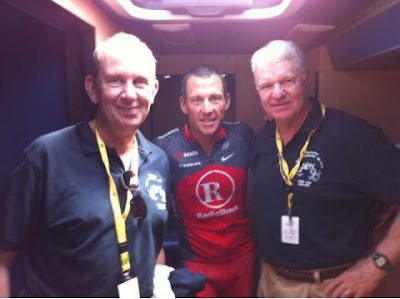 Sure, a snarky person could say that this it is a funny time, during the Tour de France, to show up in France .... and to find your way to Lance Armstrong's bus. But, the CNO is the guest of his French counterpart, and the French know how to host - boy do they know how to host; a couple of great sea stories (that are best not discussed here) - so this set-up is correct. As for timing, you could also note that this is right after 14 JUL, which is the French Republic's 4 JUL. That is a good time to visit France, because French officials are happy. This is right. I would also note that France is a nation whose navy can actually partner with us towards efforts that are in our national interest. They are a serious nation with a serious navy. This is good. When you consider some things the CNO has invested his time in - I take this as a return to seriousness. Then again, the French Admiral Pierre-Francois Forissier did visit the USA earlier - followed up with giving the CNO a medal, so it is only proper manners to pay him a visit. Nice; for what ever reason. I hope he was able to spend some time in Paris as a civilian. I have a restaurant list second to none, but sigh, he didn't ask. As we move into our second decade of conflict with Islamist terrorism, what have we learned, relearned, or having to unlearn about Counter Insurgency (COIN)? As those who control the budget look towards a post-Iraq and post-Afghanistan military - what moves will be made towards USMC force structure and equipment? Please join my co-host EagleOne of "Eaglespeak" on Midrats this Sunday 18 JUL 2010 at 5pm EST for a full hour. Our guest to discuss this will be Dr. Andrea J. Dew, Co-Director, Center on Irregular Warfare & Armed Groups (CIWAG), Strategy and Policy Department U.S. Naval War College Newport, RI. For the second half of the show, we will look at the moves being made already to gut the USMC force levels at first chance - how do we get the narrative right to fight this coming battle? Returning guest, fellow blogger with EagleOne and me over at USNIBlog, Mark E. Stanovich, LtCol USMCR will be with us to discuss this along with the latest developments with the Marine Corps. Dr. Andrea Dew is a professor at the U.S. Naval War College, Newport RI. She co-founded and co-directs the college's Center on Irregular Warfare & Armed Groups. Dr Dew is also the author of "Insurgents, Terrorists, and Militias: The Warriors of Contemporary Combat " which argues that understanding armed groups is the first step to understanding how to counter them. LtCol Mark Stanovich, USMCR, has more than 24 years of service in the USMC and USMCR. An artillery officer, he has served in all four Marine Divisions. LtCol Stanovich commanded a Recruit Training Company at Parris Island, SC, and was an artillery battery commander in 5th Bn, 10th Marines at Camp Lejeune NC and Okinawa, Japan. He served as 5/10’s battalion S-3, and was Executive Officer of 3rd Bn 14th Marines. LtCol Stanovich was deployed with 3rd CAG to Al Anbar Province, Iraq, and was a finance and economics advisor to the Al Anbar Provincial Government in Ramadi during OIF II. He was awarded the Combat Action Ribbon, Meritorious Service Medal, and Purple Heart. He is a distinguished graduate of the Field Artillery Officer Advanced Course, and has completed USMC Amphibious Warfare Course, USMC Staff Planning Course, USMC Command and Staff Course, and the NDU National Security Course. LtCol Stanovich’s civilian position is Emergency Planning Coordinator for the Vermont Department of Health. He is a qualified exercise developer, conducting cyber security, health response, homeland security, and emergency management exercises for businesses, hospitals, private entities, as well as federal, state and local government agencies. Because Run Lola Run is a great movie ... I like this musical genre ... and this is my blog. First, we all need to raise all holy h311. Second, we need to make sure this goes to the Supreme Court. I have emails out the the Salamander JAG corps ... so expect updates to this post as their briefs come in. A federal judge in Denver has ruled the Stolen Valor Act is "facially unconstitutional" because it violates free speech and dismissed the criminal case against Rick Strandlof, a man who lied about being an Iraq war veteran. U.S. District Judge Robert Blackburn issued his decision this morning. "The Stolen Valor Act is declared to be facially unconstitutional as a content-based restriction on speech that does not serve a compelling government interest, and consequently that the Act is invalid as violative of the First Amendment," Blackburn wrote in his opinion. Where do we start? Dressing up in a uniform you did not earn and wearing medals you did not earn is not speech. It is theft. This judge is a Bush 43 so there isn't a "Democrat judges" angle on this. Also, the legal team for these a55hats comes from The Rutherford Institute. John Whitehead, president of the Rutherford Institute, said the law is poorly written and should not be used to prosecute people for simply telling lies. "You have to redraft the law to prove a particularized damage," he said. "If you run around Denver and yell out, 'I got the Medal of Honor,' you are guilty of the statute the way it is written." In a recent motion to dismiss the case, Strandlof's attorney, Robert Pepin, wrote that "protecting the reputation of military decorations is insufficient to survive this exacting scrutiny." Rutherford Institute attorney Douglas McKusick argues that Strandlof's lies did not "inflict harm" upon the medals he lied about or debase the meaning of the medals for the veterans who actually earned them. "Such expression remains within the presumptive protection afforded pure speech by the First Amendment," McKusick wrote. "As such, the Stolen Valor Act is an unconstitutional restraint on the freedom of speech." Once again - if you need to understand the damage these fakes cause to veterans - read Stolen Valor : How the Vietnam Generation Was Robbed of Its Heroes and Its History . More to follow, but I have a request. - Anyone have a link to the whole opinion by the Judge that came out today? UPDATE: Got the decision. I put it on googledocs - you can download it here. UPDATE II - Electric Boogaloo: EagleOne has a post up well worth your time. Also check out Mr. Wolf at B5 and DrewM at Ace. There was/is another nation that tried to borrow and spend its way out of an economic problem that started in real estate. Do we want to learn, or wander into the same swamp? 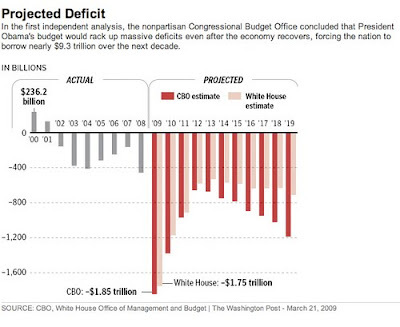 UPDATE: From those far-right groups at the WaPo and CBO - you have this jewel. Before we were a nation, we fought as one - or perhaps part of one. We learned lessons that would in two decades lead to the rise of two of the greatest world powers since Rome - one succeeding the other. We would see a leader at 23 eventually promoted to Colonel. Who fought in a loosing battle with that eventual Colonel, Colonel Washington? Together then - but on opposite ends of the field later? Horatio Gates, Charles Lee, Thomas Gage, Daniel Morgan, Daniel Boone and others. Go see the details of a field of Fullbore at RedState, about the Battle of Monongahela. The Fullbore in this case though belongs to the French and Indians. Defeats are a wonderful teaching tool. If you are under 60 - learn there what was not taught in school. You might want to call him and tell him to trim his eyebrows ... but that is a different topic for a different day. And it is fully supported all the way to the CNO. You don't have to guess or infer - no, it is plain as day. RMKS/1. THIS NAVADMIN ANNOUNCES A NEW OPEN ENROLLMENT PERIOD FOR THE NAVY WOMEN E-MENTOR LEADERSHIP PROGRAM. THE NAVY WOMEN E-MENTOR PROGRAM IS A WEB-BASED MENTORING PROGRAM WHICH SUPPORTS THE PERSONAL AND PROFESSIONAL DEVELOPMENT OF OFFICER AND ENLISTED NAVY WOMEN. THE PROGRAM CONNECTS NAVY WOMEN FOR ONE-ON-ONE MENTORING RELATIONSHIPS FROM WITHIN A LARGE POOL OF DIVERSE PARTICIPANTS. THE PARTICIPANTS INCLUDE ALL RANKS FROM SEAMAN TO ADMIRAL, AND REFLECT A BROAD RANGE OF EXPERIENCE AND EXPERTISE. 2. THE NAVY WOMEN E-MENTOR PROGRAM HAS 1200 WOMEN PARTICIPANTS ENROLLED, INCLUDING 800 MENTORS FROM ALMOST EVERY DESIGNATOR AND RATING. THE PROGRAM HAS A MORE USER-FRIENDLY INTERFACE AND HAS ADDED AN EXCITING NEW FEATURE TO THE BASIC ONE-ON-ONE MENTORING OPTION CALLED SITUATIONAL MENTORING. THIS FUNCTION ALLOWS MENTEES WHO HAVE IMMEDIATE SHORT-TERM SITUATION-SPECIFIC NEEDS TO SELECT ONE OR MORE MENTORS TO ASSIST THEM WITH THEIR PARTICULAR SITUATION OR TO POST THE ISSUE, ALLOWING MENTORS TO VOLUNTEER THEIR SUPPORT. 3. THE NAVY WOMEN E-MENTOR PROGRAM IS OPEN TO ALL ACTIVE DUTY AND RESERVE NAVY WOMEN, TO INCLUDE OFFICERS, OFFICERS-IN-TRAINING, AND ENLISTED MEMBERS. UNIFORMED NAVY WOMEN OF EVERY RANK AND RATE ARE ENCOURAGED TO PARTICIPATE IN THIS PROGRAM. THE OVERALL TIME COMMITMENT IS MINIMAL: AN EFFECTIVE ONLINE MENTORING RELATIONSHIP CAN BE ESTABLISHED AND MAINTAINED WITHIN ONE TO TWO HOURS PER MONTH. 4. MENTORS AND MENTEES ARE ENCOURAGED TO ENROLL DURING THE OPEN ENROLLMENT PERIOD ENDING 15 AUGUST 2010. THERE ARE 400 NEW OPEN SLOTS FOR MENTORS AND PROTEGEES/MENTEES. INTERESTED PARTICIPANTS CAN REGISTER AT HTTP://WWW.ACADEMYWOMEN.ORG/E-MENTOR/NAVYWOMEN. WITHIN TWO DAYS OF REGISTERING, NEW USERS WILL RECEIVE AN E-MAIL INVITING THEM TO LOG ON TO THE E-MENTOR PROGRAM SITE TO CREATE PERSONAL PROFILES, INCLUDING AREAS IN WHICH THEY NEED AND/OR ARE WILLING TO OFFER GUIDANCE AND, IF MENTEES, SEARCH FOR AND SELECT A MENTOR(S). 5. THE OFFICE OF WOMEN'S POLICY MONITORS AND ASSESSES THE PROGRAM. SUCCESS METRICS FOR MENTEES ADDRESS IMPROVEMENTS IN ACCESS TO ROLE MODELS, EXPANDED PROFESSIONAL NETWORKS, AND IMPROVED RETENTION INTENTIONS BASED ON SURVEY RESULTS. PARTICIPATING MENTORS ARE SURVEYED TO MEASURE INCREASES IN UNDERSTANDING OF JUNIOR SERVICE MEMBERS, AWARENESS OF ISSUES AFFECTING THE NEXT GENERATION OF NAVY LEADERSHIP, AND IMPACT ON RETENTION INTENTIONS. 6. POINT OF CONTACT: OSC JESSICA MYERS, OPNAV N134W, AT (703)695-1391/DSN 225, OR VIA E-MAIL AT JESSICA.MYERS(AT)NAVY.MIL. You know - I usually redact POC info on messages - but in this case I'm not. I'm sorry Chief - I know it isn't your fault, you are only doing what you are told. Nothing personal but my readers are nice. I'm just helping spread the good word, right? I got an email earlier from a reader who is a bullet-proof CAPT who actually went through the motions of trying to join - as a guy who has mentored females most of his career - but was told "You are a male - you can't mentor." He knew that - he just wanted to hear it. I just wish he had it documented. This is kind of sad, isn't it? From my generation of officer on down, we spent most of our career mentoring females. A good Sailor is a good sailor. Your #1 Div O is your #1 Div O - it didn't matter. Heck, I'm retired and via email and phone calls, I am "mentoring" a female LT, a female ENS, and a couple of MIDN. Gender based SeaMommyism is no way to grow leaders. What a strange place the people who push these programs come from, because it isn't like the Navy I know. Gender sectarianism is no way to build unit cohesion either ... but then again ... that isn't its purpose, is it? Heritage or Pork for PA and the USN? ... but can you get readiness points from it?